. . .I am glad no one but you two boys will witness me when my feet begin kicking about." "I shall not kick," declared another of the thieves, who had also regained his senses. "I shall sing while I am being hanged." "But you can not, my good Gunder," protested the king; "for the rope will cut off your breath, and no man can sing without breath." "Then I shall whistle," said Gunder, composedly. "It will be a great task to string up so many thieves. You look tired. Permit me to assist you to hang the others, and then I will climb into a tree and hang myself from a strong branch, with as little bother as possible." "Oh, I won't think of troubling you," exclaimed Marvel, with a laugh. "Having conquered you alone, I feel it my duty to hang you without assistance--save that of my esquire." As far as I know, this is not related to the Oz series. It's still worth a look. A pleasant story of the adventures of a transformed fairy and friends. A delightful, magical adventure that could only come from the imagination of author L. Frank Baum. Perfectly delightful piece of children’s literature before I begin revision of behavioral biology with Sapolsky’s book. Easy readability and it’s fun to suspend disbelief occasionally! Full of magic, and fairies and evil hearted villains, this a good read for young adults with a love of gentle adventure stories. An fairy turns mortal and goes adventuring. The premise is captivating, the narrative is charming and well executed. Baum's odd sentimental sexism is slightly more subtle here than in some of his other works. 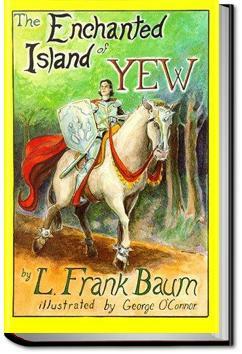 Something for your inner Ozophile: a quick, breeezy read of another fantasy world (no, not Mo or Ix, still another) created by L. Frank Baum over a century ago: the enchanted island of Yew.